Our gorgeous workshop set up in Melbourne, all styled with what we found in the Abbotsford Salvos store. My gorgeous models at our Brisbane workshop. I restyle, upcycled, sliced and diced their looks all from the Salvos. I found all these fantastic items on the $2 rack, then created looks from the collection. Definitely check out the Clearance aisle in your local op shop, you’ll be surprised what you find. The scarf I’m wearing is actually a piece of scrap material from the haberdashery section. Wear it anyway you please, I always love an asymmetrical look, then secure in place with lashings of vintage brooch bling. 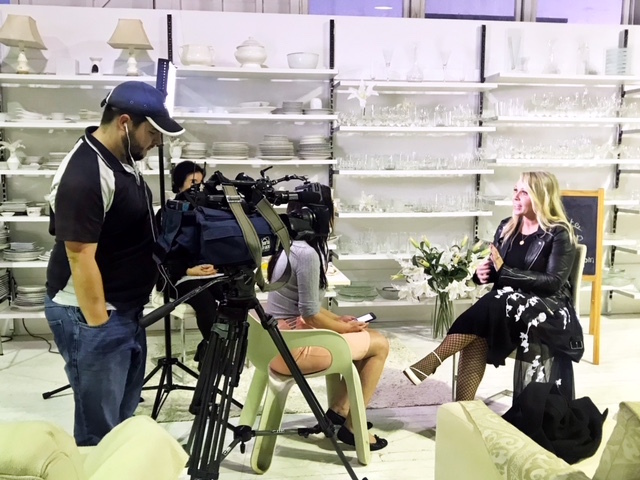 So thrilled that Ch9 came to support our zero waste message! 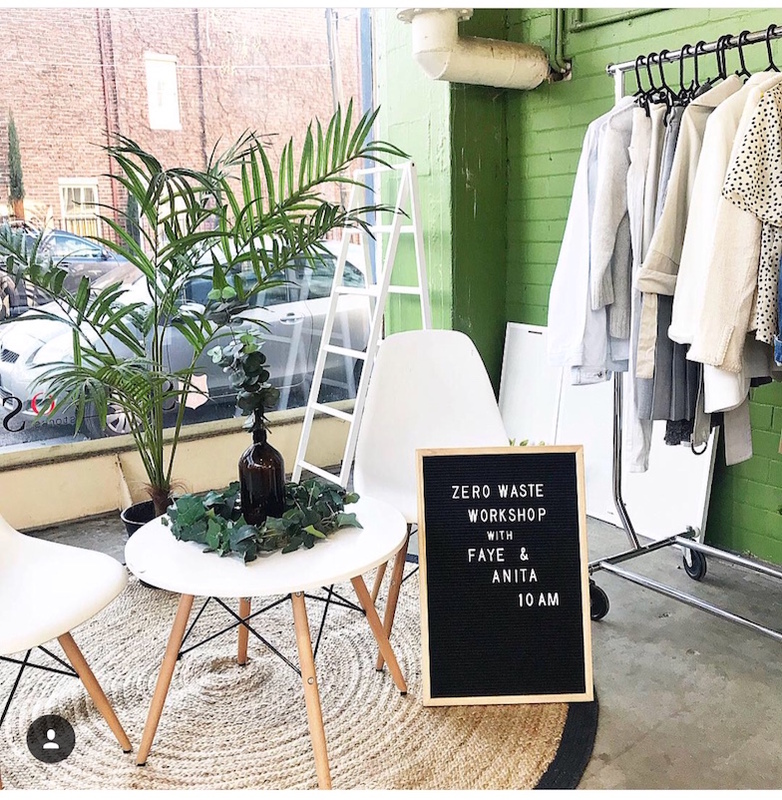 Zero Waste Workshop Ready…found all these gorgeous items at the Salvos in under 10 minutes too! A few of the looks from the $2 rack as well as some customisation. I reinvented Anita’s Salvos finds with old buttons. Incredible interest in the zero waste wisdom…it’s so wonderful to see us all stepping up. Zero Waste Warriors. Lovely Anthia in the middle is wearing two pieces from the $2 rack…yep that gorgeous plaid jacket and black dress is a grand total of $4!! (Incidentally she is the organic tea queen and an incredible naturopath who totally saved my health!) Anita is rocking my customised old button ensemble…everything you see us wearing is from the Salvos. Well what a whirlwind few weeks its been in the zero waste world! To celebrate Plastic Free July Salvos Stores and I headed up and down the coast with the lovely Anita Van Dyke to host a series of workshops. 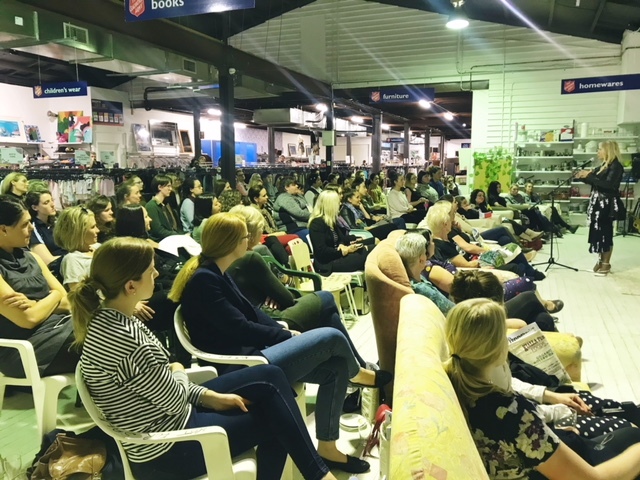 We showed the sustainable community in Melbourne, Brisbane and Sydney how to go from excess to eco luxe with ease and it was absolutely wonderful. I of course spoke about zero waste fashion and along the way gave myself some really fun challenges to walk the talk. We dressed ourselves from each location, I shopped the $2 rack and our warehouses to put together my signature preloved pretty.